Shifting winds and blazingly hot temperatures are fueling a wildfire in southern California that has now spread to 51 square miles and is now threatening several neighborhoods. The Sand Fire—named for the area’s Sand Canyon—started on July 22 and has now grown to 33,000 acres. 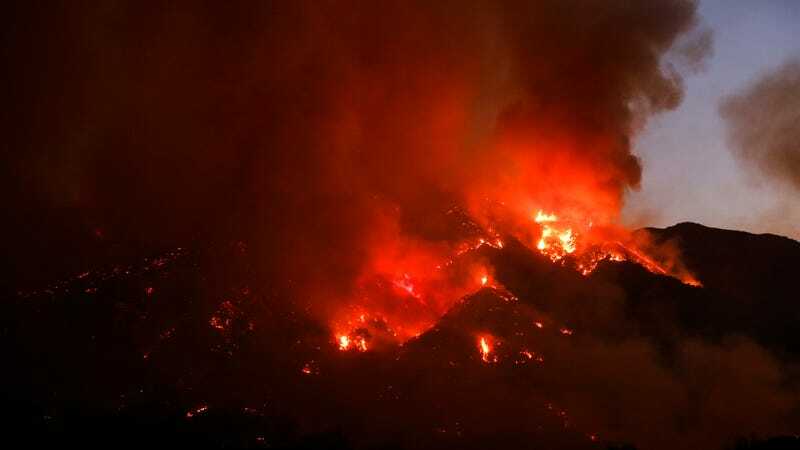 This troublesome blaze is currently burning near Big Sur and the Angeles National Forest east of the Santa Clarita Valley, about 30 miles from downtown Los Angeles. More than 1,600 firefighters with help from water-dropping helicopters are currently working on several fronts to contain the flames. As of 11:00 pm local time Sunday, the fire was 10 percent contained, but spreading in several different directions owing to variable winds. At least 18 homes have been destroyed so far, including Sable Ranch—a popular movie set used in such shows as The A-Team, 24, and Maverick. A man was found dead in his burnt-out vehicle, while hundreds of animals, including a mountain lion and bengal tigers, had to be evacuated from the Wildlife Waystation sanctuary. On Sunday, helicopters were grounded for about a half-hour when an unauthorized aerial drone was spotted in the skies above the wildfire. In just three days, the Sand Fire has spread to 51 square miles, doubling in size since Saturday night. The fire is being fueled by heavy chaparral and brush, and is spreading rapidly owing to strong, shifting winds and high temperatures. Forecasters are once again projecting 100 degree-plus temperatures for Monday. “Things got in alignment yesterday and that fire came through like a freight train,” said Deputy Fire Chief John Tripp, of the Los Angeles County Fire Department. Mandatory evacuations have been ordered for parts of Acton on Agua Dulce Canyon road north to the 14 Freeway, Crown Valley Road to the 14 Freeway and all of Soledad Canyon. An area downwind from the fire is considered to be in danger. The fires have also generated poor air quality, so people with respiratory problems are being asked to stay indoors.